Last year my husband and I sold our first home. Just last week I was in the neighborhood and drove past the house. I was surprised that the home looked different. The new owners had built a new portico and it made a big different. It truly did enhance the curb appeal of the home. 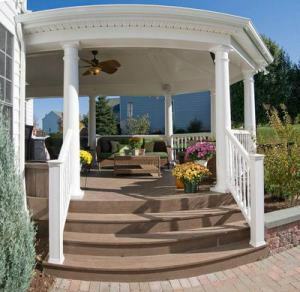 Front porches and porticos are great additions to any home when done well. They make the home more welcoming to friends and family as well as increase the curb appeal of your home. When they are not well designed, however, they stick out like a sore thumb because they don’t blend into the existing structure. 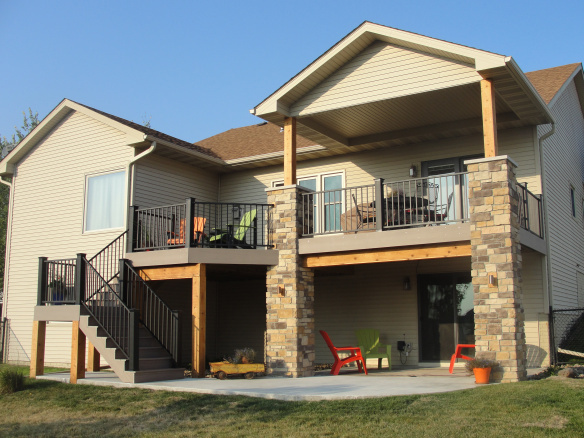 Here are a few examples of Archadeck Outdoor Living front porch projects that complement and blend seamlessly into the existing home. The owners of this first porch had some unique needs. The house is a beautiful brick and they didn’t want the porch to look like an add-on. Instead of front steps, they also needed a ramp for wheelchair access. Archadeck designed the perfect portico for them. 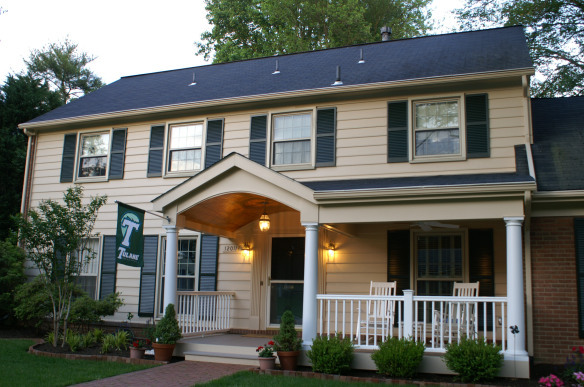 They were able to get a brick patio and ramp that matched the home’s façade perfectly and the columns and eaves were finished in the same color as the rest of the home’s trim. For the ramp, they put it behind a flowerbed so passersby didn’t see the side of it. To increase the usability of the structure, enough space was created for a small living area complete with and outdoor light and fan for the warm summer evenings. It’s the perfect place to have a drink with a neighbor. Our next example is smaller, but still made a big impact on the curb appeal of the home. 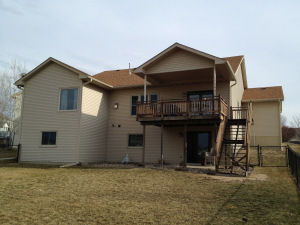 Before this front porch was built, the whole front façade of the home was flat across. There was no dimension. Creating this small portico added visual interest and depth to the building while also providing a sheltered space for visitors to stand waiting to be welcomed. 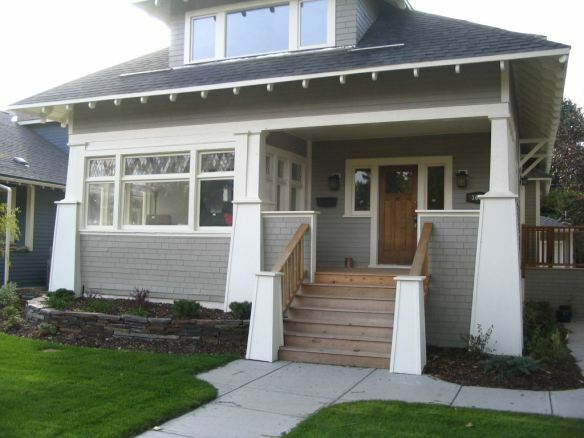 The white trim and grey skirting matches the home’s exterior while the stained wood provides a rustic finish. 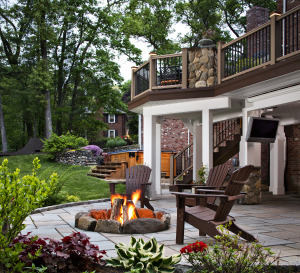 If you have questions on how to enhance your home’s exterior with an outdoor living space, please contact your local Archadeck Outdoor Living office. 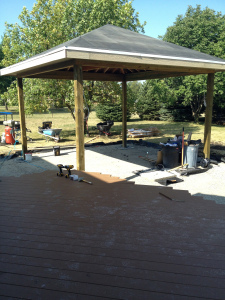 When it comes to creating a custom patio or deck design, we at Archadeck like to have a clear understanding of how you intend to use the space. Do you need space for cooking? Dining? Relaxing? Homeowners who may not know the type of structure they want still have an idea of how they’d like to use the space. From there, our trained designers can map out a space that is perfect for them. When I saw this project from our Archadeck of Central Maryland office, I knew I had to share it. It has a ton of living space without being too overwhelming. The owners of this property like to spend as much time as possible outside when the weather permits. By designing a multi-level space, John Barrett of Archadeck was able to create clearly defined areas for the owners, each one just as beautiful as the next. At the lowest level (to the right on picture) is a large paver patio. It’s an open area that provides easy access to the yard below. A custom outdoor kitchen was constructed closer to the home’s back door so the chef can easily go to and from the kitchen. John and his team recommended a light stone paver with subtle grey variations since the home is brick. Brick would have been too overwhelming throughout the space. Up a few steps is a small deck area with two lounge chairs. The homeowners enjoy laying out in the sun from time to time, and this spot is the perfect transitional area. The octagonal shape keeps it fun and interesting and because it has steps on all sides a railing isn’t necessary by law. Railings are incredibly important for safety purposes, but can make structures look closed off. Without railings, this deck is way more open to the rest of the yard. Just one step up is a dining and entertaining area. The deck is just a few steps away from the outdoor and indoor kitchens, making it easy to serve dinner outside. Again, John and the homeowners didn’t want to block off the space with railings. Instead, a built in bench and planter were used. They not only look great, but the bench provides plenty of additional seating for friends and family. The last level of the space is an open porch that works as an outdoor living room. Guests can escape the sun and cozy up underneath the roof structure. 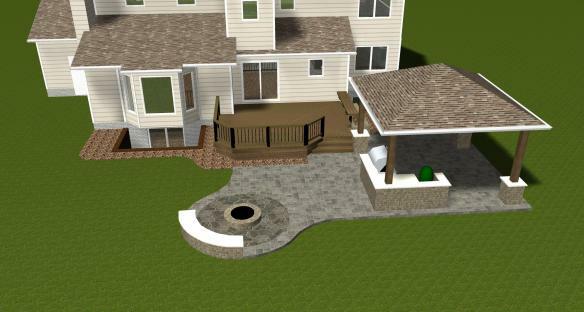 If you have questions on designing outdoor living spaces to fit your needs, please contact your local" Archadeck":https://www.archadeck.com/ office. There is something about the rain that makes me want to cozy up with a book or a glass of wine and enjoy the sound. I especially like it with the windows open, or better yet, when I’m in a dry outdoor space like a screened or open porch. 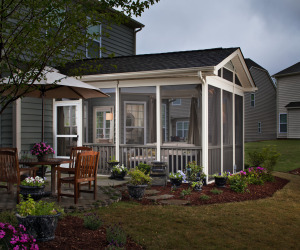 Open porches are great for enjoying the outdoors from a protected spot. They can be built with a roof structure or under decking to keep the space dry. We often get questions on what under decking is and it is pretty simple. 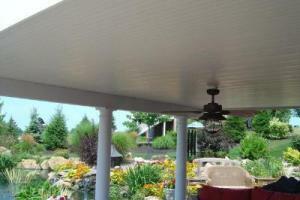 Under decking a both a roof and drainage system for open porches or covered patios that have decks above them. Decks without usable underneath don’t have under decking as it doesn’t matter if the rain goes underneath it. But if you wanted to enjoy your porch when it is raining, you need to have a drainage system to protect you! That’s under decking, or, as we sometimes call it, rain decking. Under decking is installed underneath the decking and framing of the elevated deck. It catches the water as it goes through the cracks between the deck boards and drains it at the side of the structure, keeping the space underneath dry and usable. Keeping the porch dry is not under decking’s only purpose. It also allows the homeowner to create a space with more amenities, like fans, lights and even televisions. With the drainage system in place, your porch and deck builder and electrician can install power outlets. Without a drainage system, it would not be possible. At Archadeck Outdoor Living, we use under decking to give our clients more usable space outdoors without taking up more of their yard. Instead of leaving the space beneath an elevated deck unfinished, you can use it for another purpose, dining, entertaining, etc. And if you can’t do it all at once, under decking can be installed after a deck is built. So, if you only want to tackle the deck now and the covered patio or porch later, you can do it. If you have questions on how under decking can enhance your outdoor living experience, please contact your local Archadeck Outdoor Living office. We can help you plan and build the space you’ve always wanted. Last night my husband and I went out to dinner with a friend of ours. He and his wife purchased a home last summer and learned some of its downfalls throughout the summer. 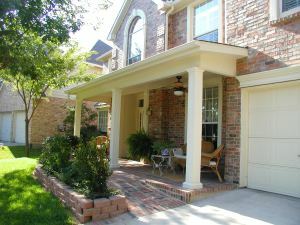 One of the reasons they bought the home was that it has great outdoor space including a great covered porch. Well, they found out that they yard also has a ton of mosquitoes to the point where they couldn’t enjoy the space. They’re now looking to screen in the existing space, but weren’t sure of the process. Screening in your existing open porch is definitely possible, but it involves more than just putting up some screens. Building codes change over time to make sure that outdoor structures are safe and secure. Before adding screen panels to your porch, your porch builder will need to inspect and ensure that the existing structure is up to code. If not, it may require more work including additional footings, connections and more. 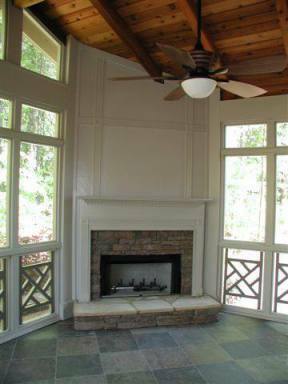 Depending on the type of existing structure, you make need to do some extra work for your screened porch to fulfill its purpose. 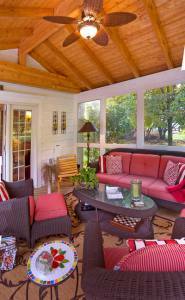 For instance, in may cases a screened porch is built to provide a dry, shady space to enjoy the outdoor without bugs. Well, if you have a porch with deck boards as flooring, you’ll need to make sure that mosquitoes can’t come up through the board cracks. When going through the process with your porch builder of enclosing the space, it’s the perfect time to consider updating the porch’s finishes. 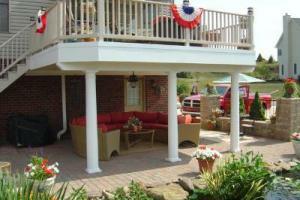 Take our friend for instance, his current open porch has a concrete floor and smaller columns. The floors aren’t in the best condition, so he’s considering having the floor updated to a more interesting tile option. 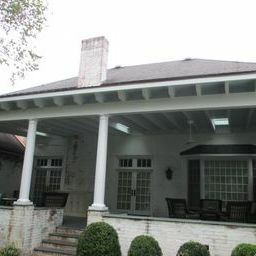 Additionally, his home has a craftsman look and the small columns don’t really fit. While the porch builder is working on the projects, the homeowner has asked the builder to add some more weight to the columns. 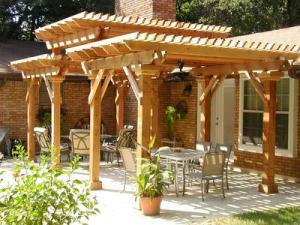 If you are looking to enclose a porch or transform any existing outdoor living structure, please contact your local Archadeck Outdoor Living offices. Our trained designers will work with you to create a space that you’ll love using! In life, it doesn’t always make sense to start from scratch with something. Working and enhancing what you have will sometimes provide you with the best end result. 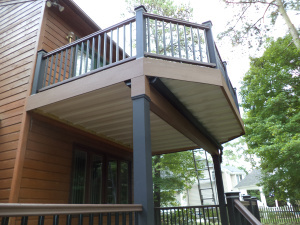 That was the case with this project from our patio and deck builder in Greensboro. 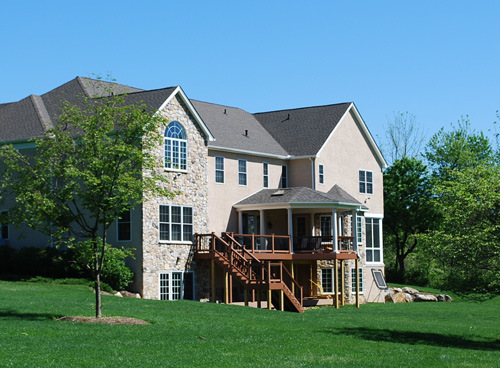 This home in the Piedmont Triad of North Carolina had a large patio off the back. As you can see, it was a raised patio that was accessible from many parts of the house. It had an area for an outdoor dining room and an outdoor living room. However, the homeowners didn’t feel they were getting much use out of it. They felt it would be better for them if the space had a roof. 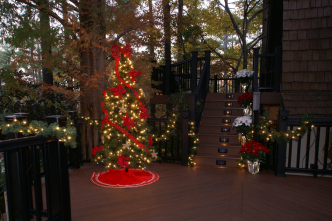 Archadeck of the Piedmont Triad’s John Mallard was brought in to design and build the open porch. 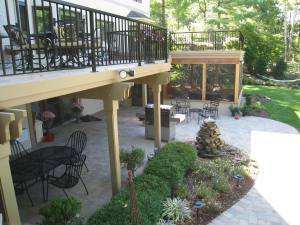 The existing patio was in good shape structurally, and it would be extremely costly for the homeowners to start anew. Instead, John suggested adding on to what was already there. The space and flow of the layout works well, all it needed was a roof structure. 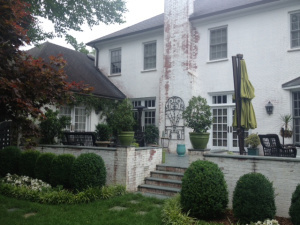 The existing brick retaining walls called for the perfect spots to add some columns to support the roof. Only four were needed for the entire space. For the roof, John suggested a few design details to make the space interesting, usable and light. The horizontal beams of the roof were left visible in the space. By simply painting them white, it added a unique design detail that could be appreciated by the family. To me, it also make it cozy. Outdoor ceiling fans were added over the dining and coffee tables of the space. While open porches provide shade and a cooler space to relax than out in the sun, they still can be warm, especially in North Carolina. Those fans can go a long way in making the space more comfortable. Light can be an issue with any covered area, especially one as large as this. Shade is key, but when the sun is blocked, it not only impacts the porch, but also the rooms inside that it is connected to. To allow for more sunlight to come in, John did two things. First, he did not attach the roof structure to the home on the sides. There is still space between the roof of the home and the roof of the porch, allowing light to come down and into the space. Secondly, skylights were placed right above the doors to the main living spaces to the home, allowing more light to come through the glass. 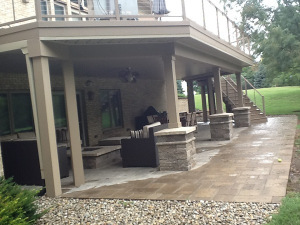 The existing patio of this project was nice, but by enhancing it just a little bit, it is now absolutely beautiful. 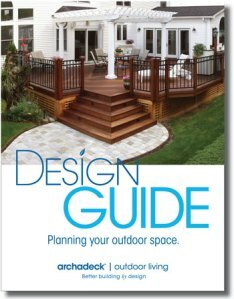 If you have questions on how you can improve your outdoor living spaces, please reach out to your local Archadeck Outdoor Living office. We post a lot about the absolutely beautiful backyard spaces that our porch, patio and deck contractors design and build, but sometimes we don’t give enough credit to the front of the home. When I saw the pictures of this front porch I knew I had to share it. It’s classically beautiful that gives the home a true “wow” factor. The owners of this property needed an updated place to welcome guests and entertain them. They live is a great neighborhood that they wanted to be able to enjoy from their front yard (and then have privacy in the back). 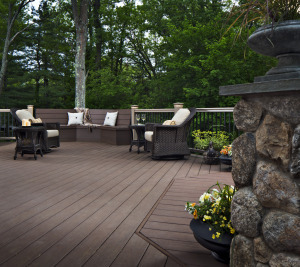 Our deck builder in Boston created a space that spans the width of the house and includes both covered and open spaces. 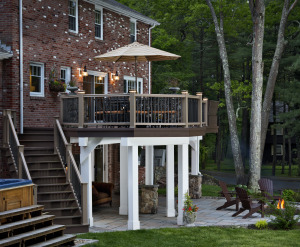 When designing the space, the Archadeck of Suburban Boston knew they wanted a portico area that provided guests with some coverage. In the cold Massachusetts nights, the homeowners didn’t want friends and family waiting in the falling snow (or rain). The portico only covers the front door because if it too went the width of the house it would block too much sunlight into the home. Many deck and porch designers don’t take the inside of the home into account when creating the space, but an outdoor project can have a major impact on the inside of the house. The front windows wouldn’t allow much sun into the home’s front windows if the porch area were any wider. While we didn’t want the covered area to be too wide where it affects light into the home, it is wider than the average portico. Most porticos aren’t much wider than the front door and that can oven make it look cramped. By creating more room under the roof structure, it makes the whole space look more inviting and accessible. The width is kept at the bottom of the front the stairs and then tapers down the to the walkway (which we will talk about below). The columns, ceiling and railings were finished in white to give a clean look. If a darker color were used, it wouldn’t have the same crisp first impression. It’s so light. While many front porches have stone floors, wood decking was used across this entire project. It makes it unique and the deep browns look great with the blue of the home and white of the railings. I love the front walkway to this home because it isn’t cookie cutter. It’s special. The three colors are the perfect complement to the rest of the front facade. The dark lines bring out bring out the black shutters and door, but it would be way too dark for the entire walkway. If you have questions on how to make your home more welcoming, please reach out to your local Archadeck office. Above ground pools are sure to bring hours of enjoyment for your family, but they aren’t known for looking pretty. A beautiful patio design could transform your above ground pool from an eyesore to a resort. Sure, that rickety white ladder allows you to climb inside your above ground pool, but does it make you feel like you’re enjoying a getaway? Adding a deck is how you spruce up your pool design and make it more functional. Pool decks make it easier to get into your above ground pool, they add space so you can sit poolside, and they hide the unsightly sides of the pool. 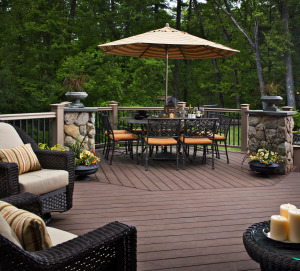 For a look that really stands out, consider adding multiple levels to your deck. This could be as simple as a landing a few steps off the ground, or you could have a level of the deck that overlooks your pool. 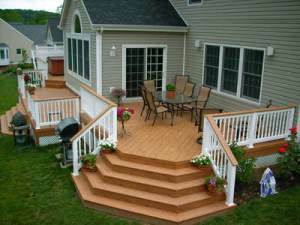 Additionally, the finishing touches of your deck are important. Don’t skimp on the rails that surround your deck; they make your space feel private… just like you would feel at a high-dollar resort. One thing is for sure… if you don’t do anything else to your above ground pool, adding a deck will instantly help it feel more like a vacation. Beautiful flowers, hedges, and succulent plants require minimal landscaping but offer maximum appeal. “Pool decks”https://www.archadeck.com/design-ideas/decks/multilevel-decks/deck-offers-greater-pool-enjoyment/ are a great space to add some greenery. Flowers and plants in pots or planter boxes around the deck bring softness to the deck and the pool area. You can also plant hedges or flowers around the side of the above ground pool (where the deck doesn’t already cover) to draw your eye away from the pool siding. Highlight it with some mulch and anyone who visits your pool will feel like they’re in a top-dollar vacation destination. A resort lifestyle includes sitting by the pool, and you can enjoy that in your own backyard with functional furniture. Look for fabric that can withstand your climate and fabric designed to catch your eye. Try out the furniture before you buy it to make sure it’s comfortable. After all, you want it to be something you’ll be able to relax in. Taking money you would invest in a vacation and investing it in your backyard is a great option to enjoy a lifestyle of luxury. 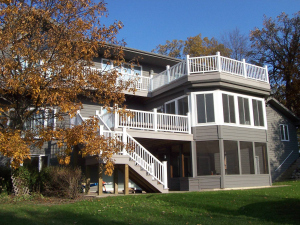 Archadeck can help you find your solution to resort living… right in your own backyard. I was recently looking through some of our Archadeck Outdoor Living projects when I noticed a theme. A theme that was both useful and beautiful: under decking. For those that are unfamiliar with under decking, it is a type of drainage system that is installed on the underside of a deck, creating a space below that is dry and usable as another outdoor living space. While some decks don’t need or wouldn’t benefit from under decking because they are too low to the ground, it’s perfect for raised decks. So, how does under decking work? A sloped drainage system is added on the underside of the deck that catches water that falls between deck boards and leads it away from the structure to a gutter, leaving the space below dry. The bottom of the system can be finished in a variety of ways that look like any other type of ceiling. Under decking creates more dry space that can be used in a variety of ways. The most common use is having a porch below. 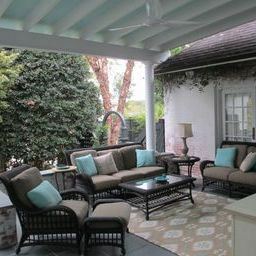 Many of our clients essentially have outdoor rooms below their decks that can be used as living rooms or dining rooms. Because the ceiling of the structure stays dry, lights and fans are often added to finish the space. Some of our clients have also added enclosures of some type under their decks using under decking. 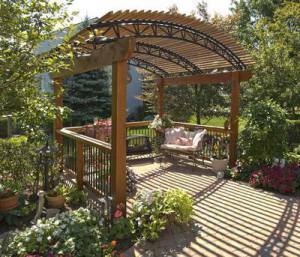 Screened porches and sunrooms can be built under an existing or new deck to create more space. I have two rambunctious nephews that cannot sit still. They’re 5 and 3 and as you can imagine, full of energy. They live in a great neighborhood with a ton of young kids. Like clockwork, when everyone is home from school, the kids race outside to play. I was visiting them a little while ago and watched the outdoor antics all from my brother’s front porch. My brother lives in a newer subdivision in South Carolina. There are five or six floor plans for people to choose from, but it’s the outside finishes which stops them from looking all the same. One of those finishes is the front porch. Some have just a simple stoop, others have a front porch that spans the width of the home and others have wrap around porches. 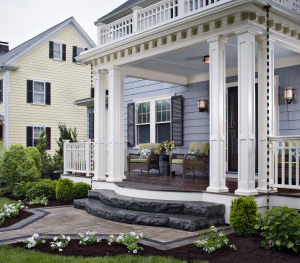 Front porches and porticos are a great way to add personality and function to your home. My brother’s porch was the perfect place sit back, catch up and still have a clear view of my nephews. Neighbors stopped by for a few minutes, chatted and went on their way. What can I say? Porches make great outdoor living spaces for spur of the moment visitors. Growing up in Maine (yup, I just made the jump from South Carolina to Maine), our front porch was where we took off our muddy or wet shoes before we stomped our ways through the house. It was essential to my mom’s sanity. When it was raining or snowing, we would slip out of our boots and step right inside. We were safe from the elements and didn’t have to track dirt inside. 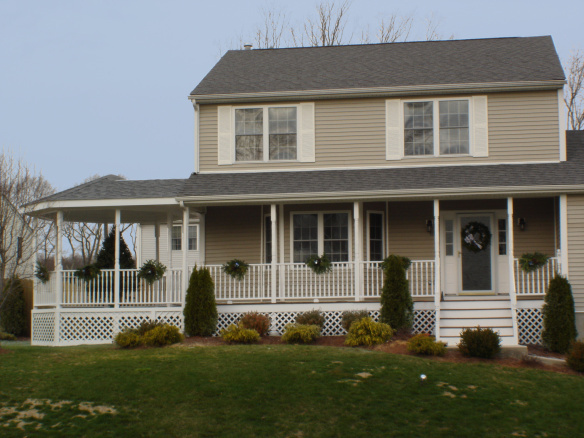 This homeowner in Rhode Island wanted a extra space on the front of your home. 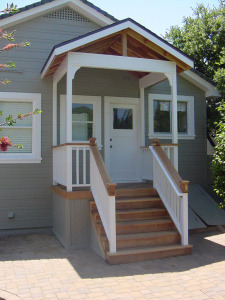 The porch and added gazebo were finished with the same roofing and trim that was on the house previously. 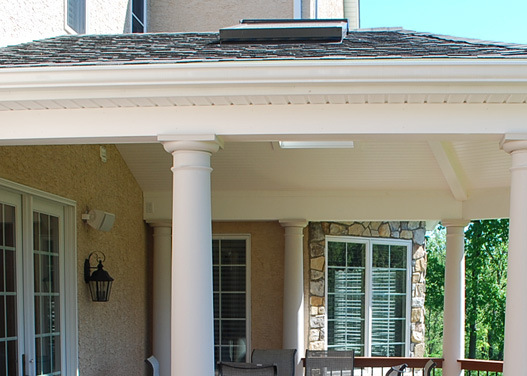 If you are interested in how a new front porch or portico can enhance the front of your home, please contact your local Archadeck Outdoor Living office. I am sure each one of us would agree that a roof is a pretty important detail in any structure. It keeps us dry and out of the elements. It helps secure other structures that are attached to it. It becomes a component of the stability of a structure it is atop. All these explanations are “no brainers”. A roof is so much more than all of these. A roof can add character and presence to a structure. What type of roof you decide to put atop your structure can really determine how sound it is, and how attractive your structure ends up. That is why it is so important to pick the right roof for the right structure. One important factor when you decide on the addition of a structure such as a covered patio, screened porch or sunroom is to choose a roof style that matches and fits with the existing architecture of your home. For instance if you have a hip roof, it is usually a good idea to carry that through when building your addition, this will keep the structural integrity of your home and the additional roof will flow into your existing roof. This “flow” is most crucial when the structure is going to be directly connected to your existing house. The same rules usually apply when you have a gabled roof. If you want to add pizazz and originality to your new addition with a gabled roof there are gable-end designs now available to add a custom look with a lot of flair. The use of a gabled roof also lends space for higher ceilings which can be a canvas for arched windows, bead-board ceilings, the addition of ceiling fans and unique lighting choices. The design choices available to structures with high ceilings are endless nowadays. Whether you are anticipating the addition of a sunroom, patio or screened porch Archadeck can show you all the choices and design a roof and living area plan to fit with your home’s architecture beautifully. Give us a call and we can make your dream come to life under one roof. Take a look at our website at Archadeck.com to see lots of pictures and learn more. 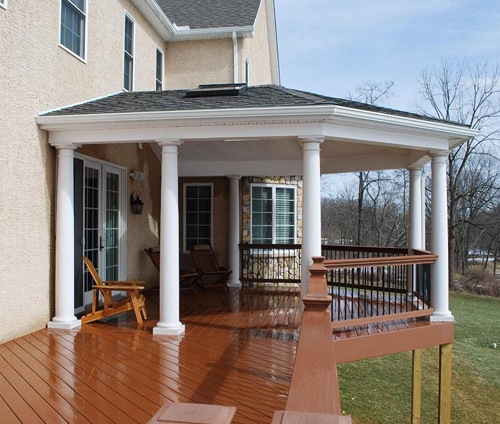 At first glance, this two-story deck in Malvern PA looks like the perfect deck. But, what makes the perfect deck? 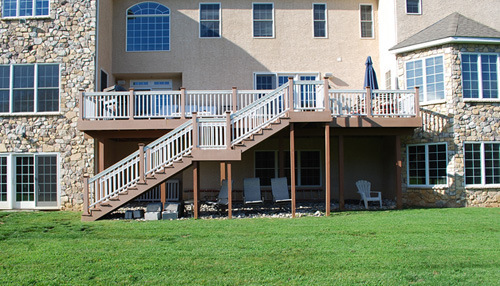 Above is the “before” deck that was re-architected, replaced and rebuilt by Archadeck of Chester County, PA. Even though this looks like the perfect deck, the owners had two problems and one issue with the deck. The problem with the deck was the damage done by their dog. 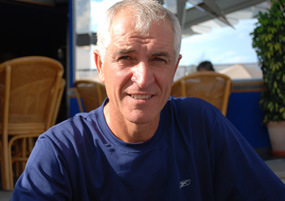 The first issue was that the deck faces southwest so it is a scorching location in the afternoon and evening. They were simply not able to use the deck until after sunset. The second issue is that the deck had a boring shape. 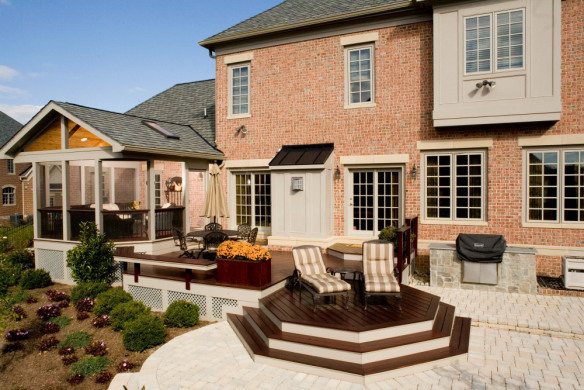 When rebuilding their deck, they wanted to fix not only the sun issue but also make their custom deck truly custom. 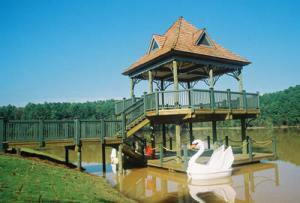 The design included both a custom deck structure as well as an octagonal covered porch. The hip roof helped achieve usable area during the afternoon and evening. The octagonal shape of the open porch added dimension to the back of the home as well as a large usable area for entertaining. You’ll notice that skylights were added to the roof to allow daytime light to flow onto the open porch and into the kitchen. The unique octagonal shape of the open porch created a duplicate octagonal area below on the patio area for extra entertaining and outside living. With any custom structure, materials are incredibly important. Because of the dog, a more scratch-resistant TimberTech XLM decking material was used using hidden fasteners. 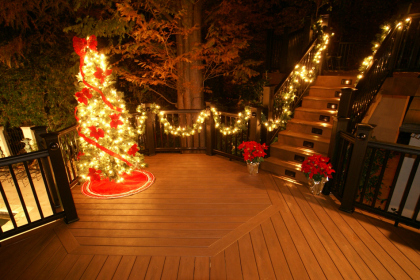 TimberTech’s XLM decking is one of their premium decking planks. It is a cellular PVC decking plank that’s built to withstand tough scratches and mildew and it has very strong stain resistance. So, XLM is a wise choice if your deck will be a heavy traffic area, a heavy spill area, a heavy rain and tough weather area, a play area for kids, an area for your pets and an area that might see heavy spills. It’s also very slip resistant. 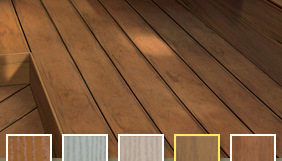 The TimberTech XLM comes in 5 colors – Mountain Cedar, River Rock, SandRidge, Desert Bronze, and Rustic Bark. 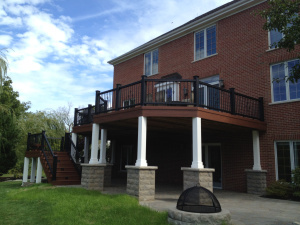 The railing is a combination of TimberTech Builder Board with an XLM cap and aluminum balusters. The columns are round, tapered, 10” Fiberglass. They are paintable so that the owner can match the trim on the house. The boards on this deck may have great weather proofing characteristics but Juan Cardona, the owner of Archadeck of Chester County wished the weather would have held off while they were building the deck. They started construction about 4 days after the first of the massive snow falls that hit this past winter. So they had to show up with a snow blower to clear away a path down to the yard and a 20’X40’ area near the deck so that the crew could set up their work site. Now the Archadeck crew has a new tool in their toolbox – a snow blower. As you think about building the structure for your back yard, think about how you want to use your structure. Do you want to entertain a lot? If so, what times of day and how many people? Do you want a quiet spot to read? Do you want a romantic spot to steal away and enjoy a glass of wine with your spouse after long days at work? Do you want to have another spot on the deck for the kids to play or roast marshmallows while you are enjoying that glass of wine over on another portion of the deck? How does your dog or cat like to use the deck? Do they want shade or just the quickest way to chase down a bird in the yard? Do you want your deck elevated so you can watch the birds in your trees? Are you one of those people who can’t spend 5 minutes outside without getting an insect bit? If so, something screened might be the best fit. If you have an idea of what type of structure will enhance your lifestyle, take a look at some of Juan’s projects online. Or just give Juan and his office a call at: (610) 696 – 3340, read their blog, or check them out on FaceBook. Do you have a lifestyle question that you’re looking for an outdoor living space to fit your lifestyle? Comment here and we’ll get back to you with some ideas!